“Sir, I know we should always keep our focus on the positive, but we see so much failure, I find myself drawn to it,” I started my conversation with The Effective Detective on a down note, reflecting my mood. The Detective stared at me for a moment before answering. “I understand your pain, Watson, but I feel your concern is misdirected. The Detective smiled. “A fair supposition Watson. That plays a part, but not in the way you might think it does. Someone that takes the risks involved in going into business will generally understand they are going to fail along the way. The nature of an entrepreneur is such that failure, while still biting, is not always a sufficient deterrent from proceeding. No, there is a different problem at work here,” The Detective paused as he usually does at this point in our conversations and smiled at me expectantly. I decided, again, to not disappoint. “You have my attention, sir. What would the problem be?” I said, giving The Detective his opening. “Sir?” I asked, a bit confused. “It is a simple question Watson, is that how a toddler learns to walk?” The Detective asked again, with just a trace of irritation. “No, of course not sir,” I recovered, preparing for the full explanation. “Correct Watson. The toddler begins with a step. Then two steps, three. In no time they are strolling around the house wreaking havoc. The toddler doesn’t worry about running a marathon. The toddler worries about taking the next step. But for some reason as adults we feel we should be immune from this cycle. We should be able to go from crawling to running the marathon. “So, as adults we spend our time looking for that silver bullet, that magic elixir which will allow us to instantaneously reach everyone in our market and turn them into faithful customers. However, as adults we have acquired something toddlers have yet to learn – caution. So we hesitate, debating over whether this method or that will make the magic happen, and we end up doing nothing. “The funniest part of this Watson is that we miss the most important aspect of the toddler’s baby steps,” here The Detective paused, waiting for me to interject and invite him to make his final point. 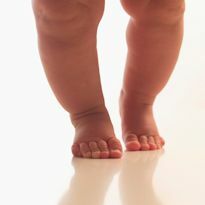 “Elementary my dear Watson, the most important aspect is that by taking baby steps, the toddler ensures success. They take a step and then pause to gain their balance. If need be they fall gently, if not gracefully, on their bum. They make small adjustments all the while making steady progress. With each attempt, they learn something new, incorporate that knowledge and move closer to their goal. “We adults on the other hand, think we should be able to bypass the process and go straight to success. Our impatience betrays us. But because we fear going all in, with good reason, we do nothing,” The Detective stopped with a look that told me the discussion was over for today. But I couldn’t resist getting one last observation in. Excellent article Matt! Very well put – I love illustrating points with analogies.